A magnificent crop of rhubarb enhances the view of the shed. The John Garne Way allotment site comprises an area of 1.39 hectares (or 3.43 acres) which equates to 45 ten pole plots, many of which are split into smaller segments. Currently there are 59 plots/segments in use, some by individuals, some by couples and others by families. The membership total is now 86, with ages ranging from youngsters to octogenarians! The site is west facing and open to the sun, giving views of the Oxford spires from the top end. 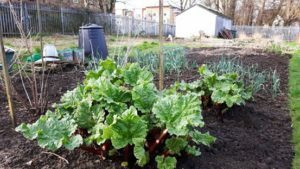 There is a shed at the site where stocks of compost, manure, onion sets, seed potatoes, seeds, canes, netting and other allotment essentials are available at competitive prices for purchase by members. The shed is open on Sunday mornings, excepting December and January. Also accessible are toilet facilities (though the water is turned off in winter) and a First Aid kit. For crop watering, there are water butts in central positions on the three plot access tracks as well as tanks containing rain water harvested from the shed roof. Bee activity can be attributed to beehives in one corner of the site, looked after by a site member. These are ‘national’ hives so, as well as providing launch pads for plant pollination, honey harvests are expected! As well as bees buzzing around, the more observant may also spot a variety of bird species, including red kites, robins, wrens, herons, woodpeckers and, if you are lucky, a red-legged partridge. Lurking in the undergrowth you may also happen upon frogs, toads and lizards. 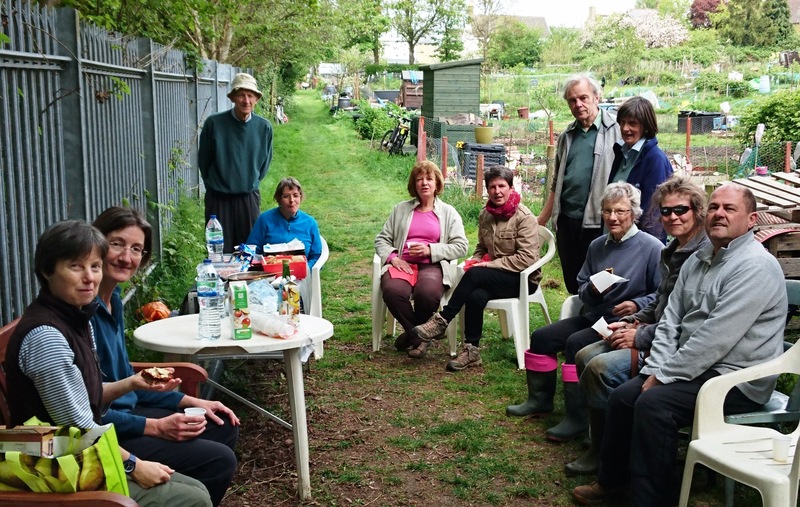 Allotmenteers in general are a cheerful and friendly bunch, happy to offer tips and share their expertise, or lack of the same, with one another. 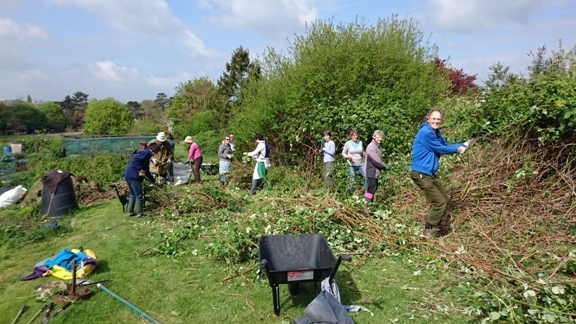 Occasional get-togethers are organised, such as work-parties, where all are invited to ‘muck in’ and help with the maintenance of the site as a whole, with bring-and-share refreshments to sustain the troops. One job the work parties don’t have to deal with is the mowing of the paths, which a committee member who lives nearby has taken on. … and afterwards, well-deserved refreshments. Then there is the Christmas social, held in conjunction with the site Annual General Meeting. So, on offer is a friendly atmosphere, exercise, fresh air and, the fruit of your labours, fresh home-grown fruit and veg – sweet corn, Brussels sprouts, you name it. And whether you need five or ten a day, an allotment has the potential to produce a fair amount of it. The site is adjacent to the rear of St Michael’s Church of England School, Marston Road and a plot is made available to the school in order to introduce the children to the delights of getting their hands dirty, contending with worms and other subterranean life, seeing things grow and, hopefully, tasting the end products. There is a gate from the school into the site. This is a popular project – there is a waiting list! 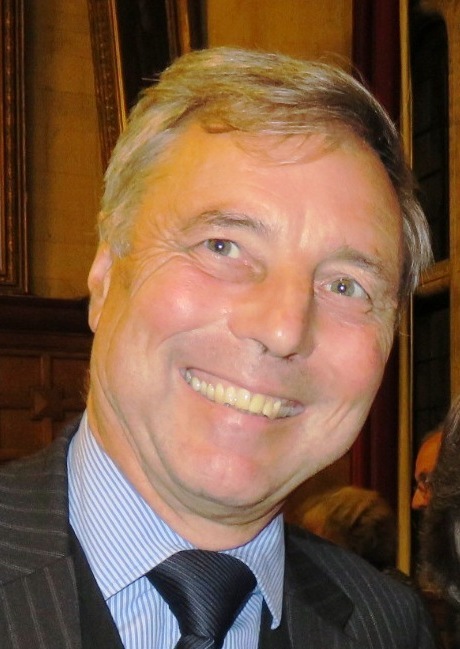 The Field Secretary, Alano Cooper (pictured), is ably supported by a strong site committee, which meets on the first Sunday of each month (excepting December and January). A summary of the committee’s deliberations is posted on the site noticeboards and emailed to the site members. The site is secured by a combination lock, the current code for which is advised to site members on renewal of their annual membership. There is on-street and limited on-site parking.